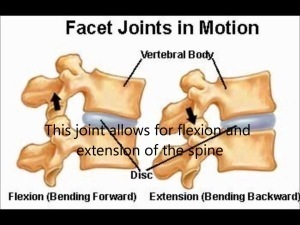 1 What Is Facet Joint Syndrome? The facet joint (or zygapophyseal joint) is a type of joint found between nearly every pair of vertebrae (or spinal bones). These are responsible for range of motion in the spine, as well as the stability of this part of the skeleton. They also ensure the appropriate connection between a pair of vertebrae. A facet joint contains protective cartilage and a capsule of liquid-like material to cushion and support it. Facet joints are served by nerve roots, which travel from the spinal cord into the body. Facet joint pain may significantly affect the quality of life for those affected. This syndrome may also impact normal movement and function. It is associated with a considerable burden on health, particularly for older adults. Any form of back pain may affect the maintenance of regular work schedules or the ability to work. Facet joint syndrome is pain associated with damage to or disorders of these joints. This may be associated with conditions such as arthritis, in which inflammatory molecules are released into the joint and cartilage is eroded. It may also be related to mechanical damage resulting from injury. Facet joint syndrome can also cause pain in the neck or back. Some estimates indicate that approximately 20% of chronic back pain patients aged 45 years or more suffer from facet joint syndrome. Many conditions and disorders may be associated with pain in these joints. These include arthritis, as mentioned above. These conditions may also cause the erosion of tissue from the joints, thus affecting their movement and function. Inflammatory molecules may be released in response to this tissue damage, which also contributes to pain. Facet joint syndrome is diagnosed by physical examination, in conjunction with other techniques such as a diagnostic facet nerve block. This involves the injection of local anesthetic medications near the nerve controlling the joint in question. If the patient experiences an expected extent of pain relief, then it is most likely that facet joint syndrome is the source of this pain. Negative results indicate that the pain is related to another condition. Medial branch nerve blocks (or more simply medial branch blocks) may be incorporated into regular treatment if successful. These may offer short- to medium-term relief from facet joint syndrome. Nerve blocks for facet joint syndrome may result in pain relief for approximately six months. Adverse effects of nerve blocks include numbness, motor problems, transient headache, and discomfort. Treatment for mild to moderate facet joint syndrome may take other forms. Resting the affected area may confer some benefit, as this reduces stress and strain on the joint(s). Physical therapy, in which the patient is trained to exercise, stretch, and condition the affected area in a manner that alleviates strains and mechanical injury may also be beneficial. This may address mild to moderate pain and stiffness associated with facet joint syndrome. Pharmacotherapy for facet joint syndrome includes non-steroidal anti-inflammatory drugs (NSAIDs) and opioids, although the latter should be reserved for serious, treatment-resistant cases. This is due to the fact that opioids have a relatively high risk and addiction profile. Other types of drug associated with pain relief include antidepressants, such as amitriptyline and anticonvulsants such as gabapentin. Patients may need to try many medications and different dosing regimens to find a drug therapy that works for them. 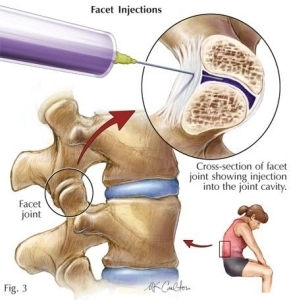 Joint injections are another option for facet joint syndrome. They are similar to nerve blocks, in that medications are injected into the facet joint to relieve pain. These injections may contain steroids, which can effectively control inflammation in cases of arthritis. Some studies have found that patients may experience pain relief of a moderate duration as a result of joint injections. The side effects of joint injections may include transient immune system suppression, pain immediately following injection, redness or warmth in the injected area, and discomfort. Some patients may not find these therapies effective or suitable for them, however. These patients may consider other procedures such as radiofrequency ablation. This procedure is usually performed after a positive response to a diagnostic medial branch block. Radiofrequency ablation selectively destroys specific portions of spinal nerves associated with facet joint pain. This is regarded as one of the most effective treatments for facet joint syndrome. Radiofrequency ablation is associated with some risks and side effects, however. It requires very precise identification of nervous tissue to be destroyed. This is performed using imaging technology, such as magnetic resonance imaging (MRI). However, if this fails and the wrong portions of the nerve are ablated, this may result in some degree of paralysis or numbness. This occurs in a small minority of cases. Most radiofrequency ablation procedures are safe and effective. More common side effects may include bleeding and discomfort in the tissues surrounding the nerve. This may be treated with conventional dressings and mild painkillers. Facet joint syndrome is the inflammation or injury of the zgyapophyseal joints of the spine. This condition may be the source of back pain for approximately 20% of older adults with this condition. These individuals may find it more difficult to move, work, and function normally. Disorders associated with facet joint syndrome may include arthritis and spondylolisthesis. The syndrome is diagnosed by examination and medial branch block. Treatments are recommended in accordance with the patient’s individual level of pain. Common treatments for facet joint syndrome include medications that reduce inflammation, joint injections, and radiofrequency ablation. Barlocher CB, Krauss JK, Seiler RW. Kryorhizotomy: an alternative technique for lumbar medial branch rhizotomy in lumbar facet syndrome. J Neurosurg. 2003;98:14-20. Cohen SP, Huang JHY, Brummett C. Facet joint pain–advances in patient selection and treatment. Nat Rev Rheumatol. 2013;9(2):101-116. Dory MA. Arthrography of the lumbar facet joints. Radiology. 1981;140(1):23-7. Dreyfuss P, Halbrook B, Pauza K, et al. Efficacy and validity of radiofrequency neurotomy for chronic lumbar zygapophysial joint pain. Spine. 2000;25(10):1270-7. Falco FJE, Manchikanti L, Datta S, et al. An update of the effectiveness of therapeutic lumbar facet joint interventions. Pain Physician. 2012;15(6):E909-953. Manchikanti L, Singh V, Datta S, Cohen SP, Hirsch JA. Comprehensive review of epidemiology, scope and impact of spinal pain. Pain Physician. 2009;12:35–70. Manchikanti L, Pampati V, Fellows B, Bakhit CE. 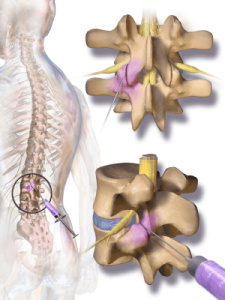 The diagnostic validity and therapeutic value of lumbar facet joint nerve blocks with or without adjuvant agents. Curr Rev Pain. 2000;4(5):337-44. Van Zundert J, Mekhail N, Vanelderen P, van Kleef M. Diagnostic medial branch blocks before lumbar radiofrequency zygapophysial (facet) joint denervation–benefit or burden? Anaesthesiol. 2010;113:276–278. Varlotta GP, Lefkowitz TR, Schweitzer M, Errico TJ, Spivak J, Bendo JA, et al. The lumbar facet joint: a review of current knowledge: Part II: diagnosis and management. Skeletal Radiol. 2011;40(2):149-57.